About three and a half minutes in Wex hated the interface. I felt bad. But, this is the sad reality of current POS management. My first POS was put up two and a half years ago and I was a tearful mess by the time Razor logged in to explain to me how to make my production lines work by clicking on things that I didn't know where buttons and dragging them around to places I didn't know needed buttons dragged. I felt bad shattering Wex's reality of the POS interface. It is another one of those things that you learn to use and once you use it you are quite effective I've put up and taken down my share of towers over the years. Normally my own. Trying to coordinate and teach someone how to do it was harder then I expected. I had learned on my own and verbalizing what was a mixture of muscle memory and the end product of failures into understanding was hard and I found myself stuttering. But, I will discuss adult learning and teaching people in another post. For now, I'm very pleased with being at the point of frustrating Wex. Why not? I love these types of projects. That industrialist focused newbie never went away. I checked out Sujarento on dotlan and noticed that we had a moon that would pretty much pay for the POS fuel in raw moon goo. The only problem was that someone else had a tower there. That was a small problem. I did have to alarm clock this op. It fell on a day off and sometimes I enjoy sleeping after 0900. However, I couldn't not show up for my own POS take down op. I got up, made breakfast and got everything together. It was a quick take down, the new tower was anchored and I started Wex down the path of misery. I am buzzing with excitement to be doing production on this scale again. I get to play with Thukker arrays. Something I advocated for low sec Capitol production. This is casual gameplay for me. Puttering about mixing my things, building my blue prints and creating stuff energizes me. Wex says that I can put his name down for, "Revamp POS." When they change that terrible interface please mention to them (whoever them is) that if we keep the scattered collection of modules it would be nice to be able to change the orientation of the modules for aesthetic reasons. Some of us take pride in how our homes look and it would be nice to be able to rotate the structures orientation to our own taste. Also it would be really cool if we could have alternative towers such as the "mining colony" (rock thing with buildings on it) or bunker or blood raider bastian thing which are existing objects that show up in pve sites. 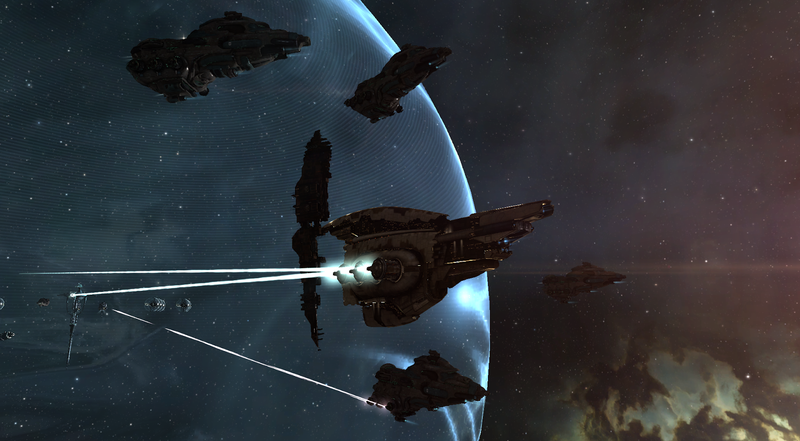 Or perhaps the extra large ship array could replace the stick in the middle when one is utilized. Its not worth being a major feature and certainly not eves biggest problem, but if existing artwork could replace the currently rather tired and uniform sticks it would be a matter of pride to have a tower which looks different even if functionally it is identical to all other towers. PS my least favorite part of the process is if my ship starts moving while I have the green box out the box moves making it painful to precisely locate the structure. Also you cant put another structure such as a gun exactly centered on an extended line off the stick, it has to be slightly to one side or the other. And finding that minimum distance it will anchor at is annoying trial and error while hoping you dont click "cancel anchor." Perhaps the box could be red when it is at a spot where it can not be anchored? My OCD demands improvements. Agreed, this would be amazing. Having just finished (sort of) putting up a POS this would be hugely helpful. So would the ability to online more than one thing at a time. I went from, "This will be great fun because I love to learn new things," to, "I hate this. I hate everything. I need a stiff drink and a shot of morphine," in the space of about 5 minutes. Well frustrating Wex is a feat!! Well done CCP, congrats! Now.... fix the damn interfaces!! Lots of little improvements have made POS life a ton better, but there is still some distance left to go. The little things like being able to dip into various structures without boating around are a really great quality of life improvement. Its hard to remember just how bad it used to be. Yup I agree with the above, security of a pos is also something that needs fixing, ie audit trails of who placed, took what, and while we are at it how about the same for corporate offices? I just recently moved back into whs after finding a corporation which provided pos setup. Sure all my ships will probably get stolen at some point, but I'm happy to risk a few billion isk to avoid that miserable interface. You need to click on the arrows, not in between. When I click the arrows it makes the box jiggle out of alignment. Interesting, seems like a bug. Tested it again, and for me it very reliably brings up the 'anchor here' menu if i right click anywhere on the arrow. Does not work by trying to click middle or anywhere else. I feel your pain. I once set up a 200 gun (including offline replacements) large POS. 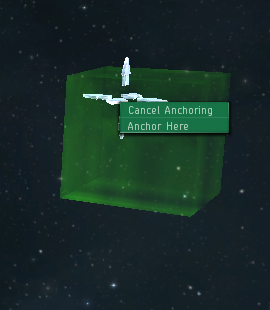 Could you suggest CCP to create an "anchor this in a random position" menu to POS modules in your ship cargo bay? You just click it, it appears somewhere randomly (under shield for arrays, outside for batteries).